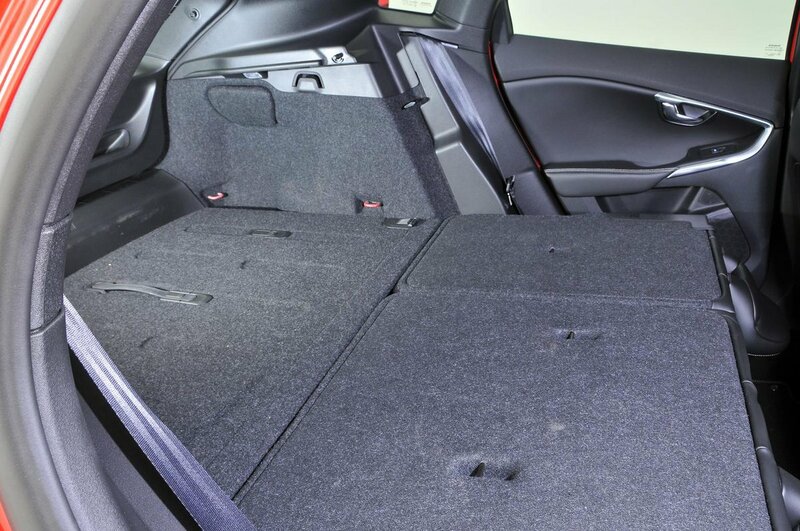 Volvo V40 Boot Space, Size, Seats | What Car? There’s plenty of room up front for even tall drivers to get comfortable, although the Volvo has fractionally less head- and leg room than an Audi A3 or a VW Golf. Avoid the optional panoramic roof if you’re very tall, though, because it cuts into head room. Storage space is good. There’s a shallow cubby hidden behind the upright fascia of the dashboard, and it’s rubberised so is ideal for storing parking change. You can also slide your phone in there if you haven’t got it plugged into the USB input, which is hidden away in the centre console cubby that also doubles as an armrest. The glovebox is big enough to store the usual gubbins, such as an ice scraper and high-visibility vest, and there’s a separate space that would be ideal for holding a small portable sat-nav device. There’s still space to keep the owner’s manual in there, too. The two recessed cupholders up front will be fine for all but the largest takeaway cups, and are conveniently right next to the driver’s elbow, while the door pockets are big enough to hold a 1.0-litre bottle. Head room is a bit tighter in the back of the Volvo than it is in most rivals, but two sub-six footers will be comfortable enough, since the bench seat is well shaped and leg room is on a par with most cars of this class. The middle passenger will be less comfortable, though, because the V40’s cabin is fairly narrow, and the centre of the 60/40 split rear bench is a narrow, raised and fairly hard section. A raised central tunnel means they’ll have to splay their legs either side of it, too. A couple of small cubbyholes at either side of the bench could be used to store small items at a push, but in reality they’re fairly useless. Instead, the door pockets (which will hold a 500ml bottle) or the map pockets on the back of the front seats will have to suffice for most items. You also get a central armrest with two cupholders on all variants. The rear seats are split 60/40, and are released by conventional levers that you pull on each outer shoulder of the bench, at which point the seatbacks need a light push to fold flat. You can do this from the boot, but it’s a stretch. If you’ve added the inexpensive variable-height boot floor (which we recommend), the folded seats will be flush with the floor. If you haven’t invested in the floor, there will be a step when the seats are down. Inscription and Pro variants of R-Design and Cross Country models get a height-adjustable front passenger seat with lumbar adjustment. 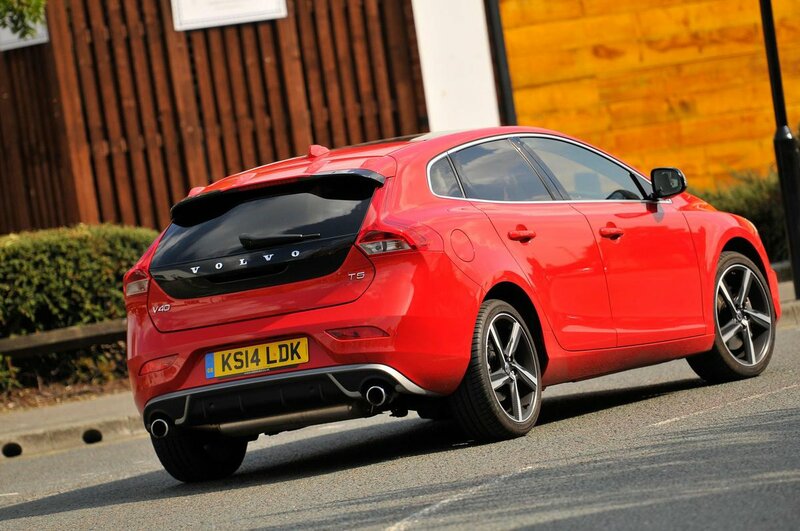 The V40’s boot is smaller than those of most rivals by a fair margin. 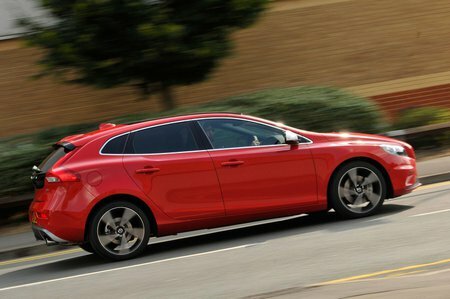 It has a narrower boot opening, too, so if you regularly carry really bulky items then this isn’t the best family hatch for you. Still, the boot is fine for normal use – and if you add the variable-height floor, it’s also cleverly designed. The boot floor is hinged, so it’s an easy, one-handed job to lift and fold it upwards, and to secure it in place, which gives you full access to the space below. When folded up, the boot floor also keeps your shopping bags in place.